There is no doubt about it Pepe Reina was a quality player, in my opinion the best keeper we have had for a number of years. I can remember people saying that he was a future Liverpool captain and i wasn't arguing with them, that's how highly he was rated. In his final season maybe two I think his level dropped from the previous highs, I don't know why, but something changed and it appeared that as the levels of adoration dropped so did Pepe's love for our club. But we must remember the good times, there was a period when we loved Pepe and he loved us. Pepe did seem to fall out of love with Liverpool, perhaps he had his head turned by bigger and better things at Barcelona, perhaps it was just the evil agent whispering in his ear but it left a slightly bitter taste hearing one of your better players offering himself to Barcelona at a stage when most at Liverpool were prepared to keep giving him chances despite poor form. This obsession with Barcelona left Brendan Rogers and Liverpool with no option but to bring in a replacement, we could never take the risk that we could be left without a keeper, if Barca clicked their fingers Pepe would have gone running, so Mignolet arrived. The summer moved on and Reina was left with a slightly eggy face when the offer never came, but Liverpool now had two keepers with Reina as a possible substitute earning around 100k a week. The obvious solution was to get rid. Napoli saved the day taking Reina on loan for a season. 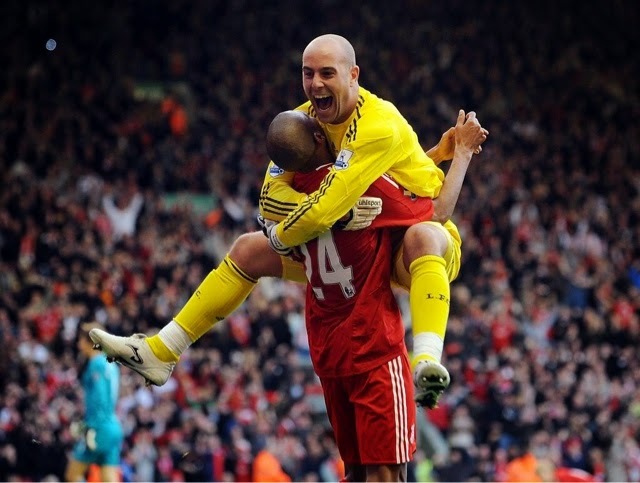 Now was the time for Reina to admit he had made a mistake, who would blame him, he tried for his dream move but it didn't come off, just keep your head down, work hard and see where things take you not burn bridges with the Liverpool management in the form of a letter that despite praising the fans openly criticised the management. "if I have one regret, it is the way that I am leaving. It is only natural that I would be disappointed that the Liverpool management agreed to loan me to Napoli without telling me first, I thought that I deserved better than that even though I understand that difficult decisions have to be taken in football. A lot has been made about me informing the club that if an offer came in from Barcelona that I would have liked them to consider it. But I had also spoken to the club about the possibility of extending my contract if the offer was not made. I told the manager that I wanted to play for Liverpool and that Barcelona would only become an option for me if the opportunity arrived, like the rumours said it would, as it would be a chance for me to go back home. When it didn’t come I was happy to fight for my place so I was surprised that Liverpool decided it was in the club´s interests to send me to Napoli instead." I read that as wanting to have your cake and eat it and blaming the Liverpool management when things didn't go your way, I'm sure Rogers felt the same way, so when Reina was forced to return when it appeared nobody wanted him I can understand why Rogers left him on the bench and with little prospect of things changing. Pepe doesn't look happy, but what does he expect. I hope and believe that he was told that he wouldn't be playing any part for Liverpool this season and that he should find himself another club. It looks like that is what he has done and he is now joining Bayern Munich for a couple of million pounds and more importantly Liverpool have got rid of a large salary. 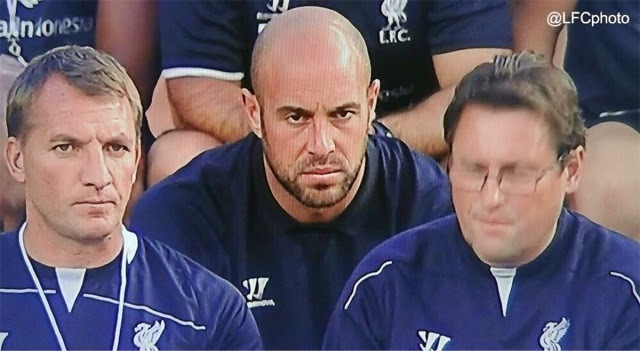 I think we will be seeing more pictures of Reina looking miserable on the bench as surely that will be his role in Munich, but we should remember the good times between 2006 and 2009 he was one of the best in Europe breaking records for clean sheets so thank you Pepe and good luck, I just wish things had been different.